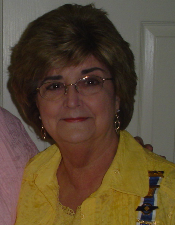 Donette Clark Sellers passed away peacefully at home with her family at her side on February 1, 2019. She was born on January 6, 1944, in Augusta, Georgia, the oldest daughter of Lanette Fortson Clark Cassell and Donald Edward Clark. All her life, she was an avid reader, excellent cook and seamstress, and a talented decorator. Her abiding love was for her family and its history, and in 1984, she became a member of the Daughters of the American Revolution, signifying her knowledge and pride in her ancestors’ family history and dedication to the principles of the United States of America. She was a leader in her chapter and her fellow members elected her Regent three times. Later in her life, she was the driving force behind chartering a new chapter, the William Branch Giles chapter in Pulaski, Tennessee. Donette’s ancestors had a long history of contribution and sacrifice in the cause of the United States and preservation of freedom. She continued her interest and love of genealogy by gaining membership in the National Society of Southern Dames of America, the United Daughters of the Confederacy, National Society of Daughters of American Colonists, the United States Daughters of 1812, and the Continental Society of Indian Wars. She was also a member of DAR’s Cameo Society and received the United States Daughters of 1812’s highest honor, the Spirit of 1812 Award for 2017. A well-known member of the Tennessee Ornithological Society, she served as president of the Buffalo River Chapter for over 20 years. Because of her contributions and expertise in the field of ornithology, she was awarded the Distinguished Service Award in 2011. In 1994, she successfully had Lawrenceburg, Tennessee, named a Bird Sanctuary in order to protect and preserve the birds for future generations. In addition to ornithology, she was also a lover of nature and was an expert flower gardener. She was a lifetime member of the Tennessee Federation of Garden Clubs and won many awards for her beautiful and creative flower arrangements. Her flower and herb gardens at her home were a source of peace and relaxation to her family members every spring and summer. Above all, however, she was the beloved wife of Terrell Marshall Sellers, her childhood sweetheart whom she married in 1963; the adored mother of Terri Lynne Sorquist (Michael) and Laura Anne Taprantzis (Andreas); the treasured grandmother of Alyx Brittany Chandler and Zachary Douglas Chandler; the dear sister of Barbara Anne Unger (Jan) and Kathy Green; and the devoted daughter of her parents, both of whom preceded her in death. A brother-in-law, Harold Green, also preceded her in death. A member of First Methodist Church of Lawrenceburg, Tennessee, she was a Christian who lived her life as commanded by Jesus Christ and was a wonderful example to her family. She dedicated her life to caring for her family and being a model for them all in her strength, modesty, and femininity. Arrangements are being handled by Neal Funeral Home, 231 N. Military Avenue, Lawrenceburg, Tennessee. The family will receive friends from 10:00 AM to 12:00 PM Tuesday, February 05, 2019 at Neal Funeral Home. Funeral services will be conducted at Neal Funeral Home at 12:00 PM Tuesday, February 05, 2019, with Carol Modlin and Ed Trimmer officiating. Graveside committal will follow at Huntsville Memory Gardens at 3:00 PM in Huntsville, AL. Her family requests that donations be made to the Tennessee Ornithological Society or the Lawrenceburg Public Library in lieu of flowers.